A family retreat in rural Minnesota chockful of good memories. A Pittsburg Foursquare house fits a Stickley collection to a T.
Years of dedicated renovation result in a home with great integrity. An architectural gem is also a great family house. A South Carolina ranch gets a complete makeover. Readers share their feedback and recent discoveries. A new colum answering your Arts and Crafts collecting questions. 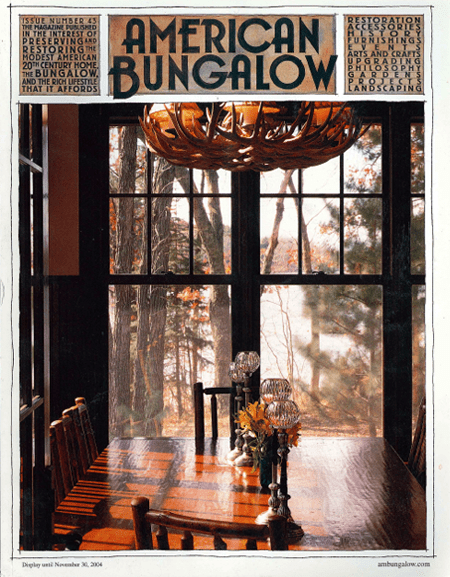 Furniture, needlework, sinks and paint for your bungalow. Fine furniture and custom millwork in upstate New York. The latest events, auction news and preservation updates. Her House is by far her best investment. Our expanded listing of Arts and Crafts volumes.